Our adventures continue as our players fend off a troll biker gang in a high-speed chase, then flee to some abandoned tunnels and run into even more danger. Watch our sessions live on twitch.tv/gorbash722 every Sunday night beginning at 9:30pm Central. A lot can go wrong with video capturing and live streaming. I suppose I’ve been lucky thus far to run into a minimum of issues. Unfortunately fate reared its ugly head during last night’s session: my streaming program Open Broadcaster Software crashed multiple times and ended up corrupting over half the recorded video. Ironically I was disconnected at one point, which forced a reconnect and seemed to fix my issue, leaving us with at least some video – a good 45 minutes worth in fact. Thus the above video represents the second half of our adventure last night, with the first half (most of the highway battle) lost to to the ether. But you can always read about it here! Our third session in the “Road Rage” adventure picked up right in the middle of the exciting highway chase combat scene that had unfolded at the end of last week’s session. My players had to fend off half a dozen troll bikers with mounted AK’s and zero interest in talking. 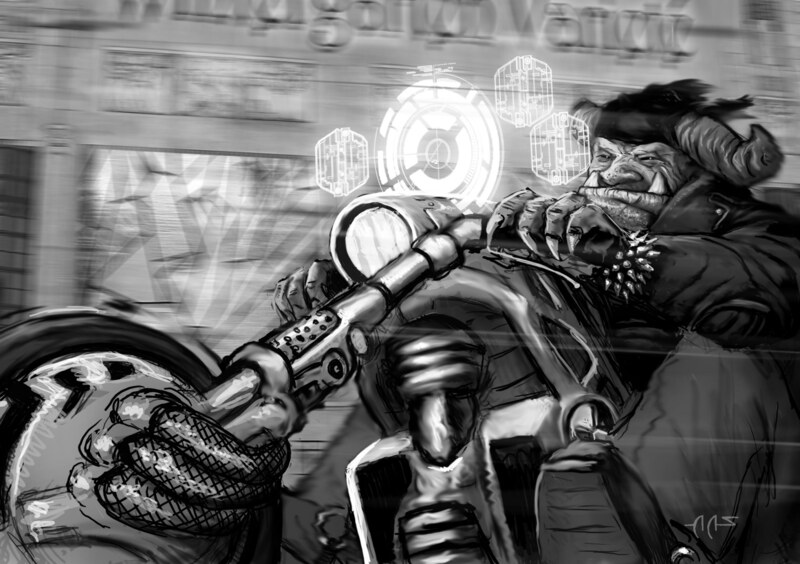 I had our missing player from last week roll Initiative along with the rest, and a forced Pilot Ground Craft test put him right in the thick of the battle on a stolen motorcycle. The combat reached some much more interesting outcomes as one of the troll bikers leapt from his bike onto the armored truck to set a demolition charge, while another succeeded in a Cut-Off chase maneuver, forcing my NPC truck driver, Crank, to make an emergency test. He failed and slammed into a car in front of him, spinning that poor car into the guardrail, doing further damage to the truck and losing speed. The players continued to take shots at the trolls and were slowly gaining some ground. After all the heavy attacks on the truck, a panicked Crank suggested they need to get off the highway and flee to the abandoned tunnels to escape the gang. At that point the gang was reduced to only two trolls, and as I anticipated the players were reticent to suddenly change course. That’s when more troll gangers appeared on the opposite side of the highway, read to cross over at the next median break and join the fray. I definitely wanted to create a tense action-packed atmosphere, and make the situation dangerous and dire enough to warrant the players essentially fleeing the battlefield despite their steady progress. The players themselves had taken hardly any damage but both vehicles had taken a toll, and I emphasized the danger of the damaged truck continuing at these speeds. The players agreed, and fled to the nearby tunnels using a GM-directed ‘cutscene’. The tunnels were almost the antithesis of the highway – slow and spooky. Light and visibility suddenly became a big factor, and I quickly found that my players grew frustrated with the overbearing Fog of War. Considering I can use the GM layer to hide creatures and objects, it was probably a bit much. The way forward was blocked by a broken down truck, and it was a fun opportunity for the players to divvy up what they wanted to do – some kept watch, some helped move the truck, and others explored the dark corners of the tunnel. I made sure to constantly ask what everyone was doing, as an attack was imminent. The session ended just as a lone ghoul approached from the edge of the tunnel, while another pair of players stumbled upon a pair of them in a dark hole. Going straight from one non-negotiable combat scenario to another may prove a bit too much, but I’m hoping they provide such varying experiences as to remain enjoyable as our players continue their hard-fought journey.